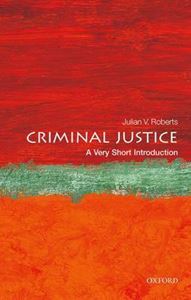 Quick overview In this Very Short Introduction Julian V. Roberts identifies the principal objectives of the criminal justice system and the way in which it works around the world. Analysing a number of case studies about a wide variety of issues, including court processes, sentencing, and prison life, he draws upon the latest research and practice. The criminal justice system is wide ranging; from the crimes themselves and policing to the sentencing of offenders and prisons. In this Very Short Introduction Julian V. Roberts draws upon the latest research and current practices from a number of different countries around the world. Focusing on the adversarial model of justice found in common law countries such as the United States, United Kingdom, Canada, and Australia, he discusses topics such as the uses of imprisonment, the effects of capital punishment, and the purposes of sentencing. Considering the role of the victim throughout the criminal justice system, as well as public knowledge and attitudes towards criminal justice, Roberts critically assesses the way in which the system functions and its importance around the world. ABOUT THE SERIES: The Very Short Introductions series from Oxford University Press contains hundreds of titles in almost every subject area. These pocket-sized books are the perfect way to get ahead in a new subject quickly. Our expert authors combine facts, analysis, perspective, new ideas, and enthusiasm to make interesting and challenging topics highly readable.